Many new bloggers think their job is done when they hit the „publish“ button. But in truth the real job starts now. The job of spreading the word about the post, checking if the post resonates with the audience, getting links, engaging the audience… There is a lot to do to make sure the whole blogging venture is not turning into a frustrating talk-to-yourself hobby. A couple of days ago, I published a post about the things you need to do BEFORE you publish your new blog post. 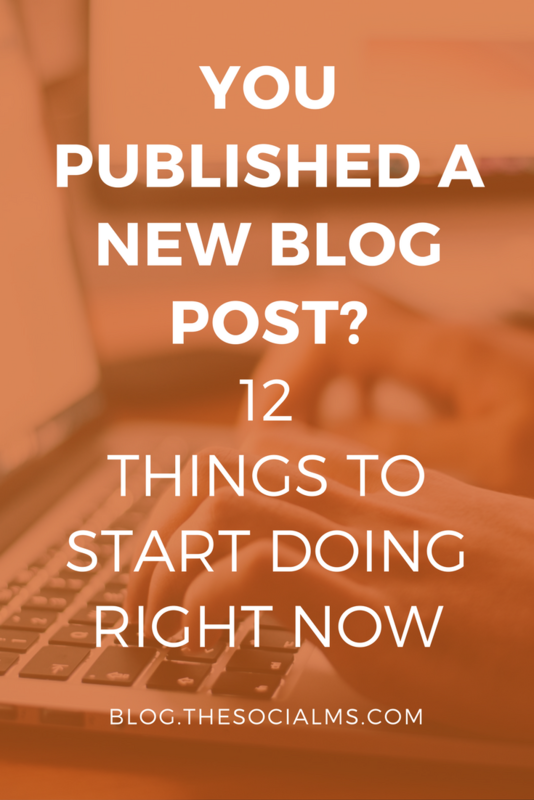 Today’s post is all about the things you need to do AFTER you published your post. You want to do everything you can to make the post take off and earn the attention it deserves. And there is a lot that you can do. The difference between blogging and successful blogging depends largely on how serious a blogger takes the job AFTER publishing a blog post. There are a couple of things you need to do directly after you publish the post. Some very important tasks will only become relevant a couple of days – or even weeks later. Many bloggers think about linking from new posts to old ones. But it is at least as important to link from old posts to new posts. Especially if you have some old posts that get significant amounts of traffic whether it be from search or social media or other sources, linking from these old posts can help give your new post a great start and some initial attention. The internal linking structure of your website can also tremendously influence how your pages rank in Google. Are you active on social media? Share your post: Tweet it – adding „new post“ to it may even give you some additional attention. Post it to your Facebook page. Pin it to your main board on Pinterest. Share it to LinkedIn. Make your post spread as far as you can to your own social audience. Whatever groups you are active in may also be a good place to spread the word about your new post. Keep in mind that groups are not a one-way street and need some interaction and engagement from your side before they will work in your favor. Simply shouting out links to your posts in groups rarely works – rather it often results in you getting banned from the group. However, there are groups especially for bloggers, where you can connect and interact – and bloggers help each other. These can help you spread your awesome new post. You can even take this one step further and create content with this option in mind. Expert roundups or lists of experts give you the opportunity to mention the experts and ask them to help you spread the word. They are usually more than happy to help you spread the word, if your post is good and acknowledges their expertise – and your post can profit from this additional audience for free. You may just have some contacts, friends, clients who have been looking for exactly this content. Let them know that you finally covered it. But be careful, don’t treat every person you have spoken to as your close friend who has just been waiting for you to publish this post. If you don’t have a relationship with the person this can be seen as spam. Your newsletter will grow into one of your best traffic sources. And one great way to keep in touch with your subscribers is to let them know about a new post via your newsletter. Social bookmarking sites like StumbleUpon can be a great source for traffic. Simply keep in mind that this traffic may often not be the best converting traffic. This is what many bloggers neglect. They do share a new post on social media, but they don’t utilize the power of networks like Twitter or Pinterest that allow you to re-post a blog post after a couple of days. And that means they are missing a huge opportunity for traffic from their social audience. Tweet your post again after a couple of days – and repeat it again a few days later. Even on Pinterest, just pinning once to your main board is not enough. You need to keep your pin active, by pinning it to other relevant boards and even repinning it after a couple of weeks to the boards you already pinned to. Constant activity on social media like Twitter and Pinterest is key to tremendous amounts of traffic. An engaged audience is always a good audience. If you get comments to your posts, answer ALL of them. I know it is hard, especially if you have a ton of posts and comments keep coming in even years after you published them – and you are busy working on something else. But if your audience is taking the time to engage with you, not answering the comments means you are missing a chance to connect. This is important right from the start, even though it becomes more important later on. Sometimes your first choice of a title for your article is not responding well with your audience – if you get this feeling, simply try a different title in your next social media update and see if it works better. The same goes for images. If you are not happy with the repins, retweets you get: make a different image and see if it works better. A finished blog post is not yesterdays news. You can take the content and use it again. One of the simplest ways is to collect a number of posts on one topic and write a new post with this collection. If you don’t have so much of your own content on one topic, you can also use other people’s content in the collection and add yours to it. You can also syndicate your post and republish it on another outlet like LinkedIn, Medium, or Quora. Just write a new title and introduction, and link back to the original post. There are many more ways to repurpose content, here are some. After a couple of weeks, you should also check, if your post gets VIEWS in Google search – you can use Google search console for that. Check for which keywords your post ranks on Google. If you get views but people don’t CLICK you should check if you mention the keyword, for which your post ranks, in your meta description. If necessary change the description so that more people will see a connection between the description and what they searched for. This will help your post get more clicks from search for the keywords it ranks for. You should rethink some of the above tasks later on. You can see that your job is by far not done, when you publish a post. For optimal results, you need to get most of the above tasks right. And never stop optimizing, there is always something left that you can do better! 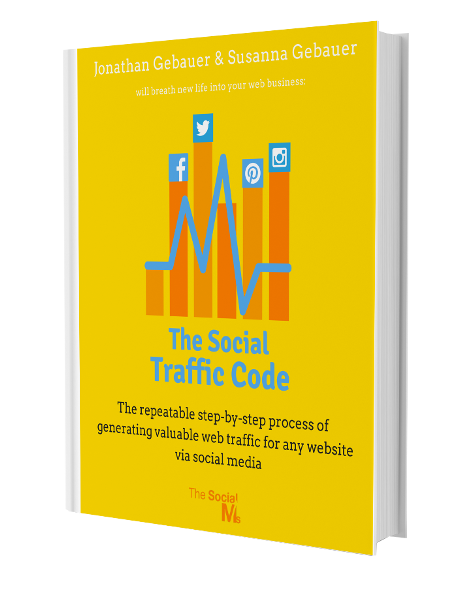 Get the key to (free) social traffic!